Sometimes, I have moments where I’ll be sitting on the sofa, dilly-dallying or working on my computer, and suddenly get the urge to get up and make something in the kitchen pronto! It seriously happens out of the blue. 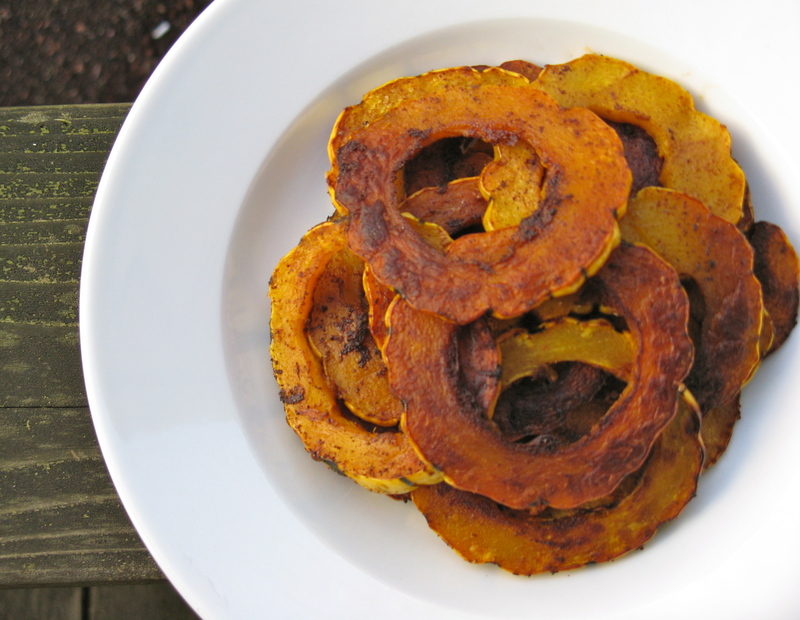 These baked delicata squash fries are the result of one of those moments. This is a simple recipe and maybe something you’ve made or tried before, but for me it was new. Sure, I roast veggies and squash all the time, but this was my first attempt at squash fries. Anyway, make these and do your best to save some for your husband, wife, significant other, roomie, kids, etc. If you want though, you can keep them all to yourself and I won’t blame you one bit. I resisted eating the whole batch and saved some for Jesse. Could I have downed the whole batch? Yes, easily. But, I felt like Jesse deserved to taste these cinnamon-coated morsels, especially because he loves delicata squash so much. 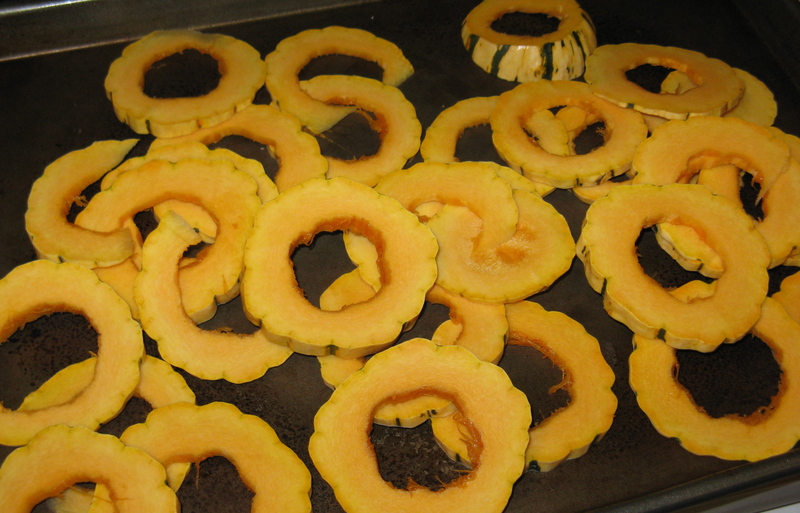 Place squash rounds on a baking sheet and pour melted ghee over top. Sprinkle on the cinnamon, chili powder and sea salt, and toss together. Bake for 15-20 minutes, stirring a couple times to prevent burning. Serve right away, as the fries get kinda soggy after sitting out for a while. There is nothing wrong with adding light/reasonable amounts of salt to your food, but opt for better quality, non-iodized salts like sea salt. Sea salt also supplies the body with trace minerals. I know Cordain has lightened up on his views regarding saturated fats, but I’m not sure if that applies to salt too. Also, if you’re not eating processed foods, which are generally high in sodium, there’s really no harm in add salt to your foods. Remember, you body needs salt too! Of course squash with cinnamon is your fave 😉 Delicata squash is incredible and the skin is thin enough that you can eat it. They’re getting harder and harder to find though since the season is winding down. Some of the ones I have seen in the store look a little old too. This one happened to come in our CSA box and tasted great! Haha yes! I know I was shopping today and they only had acorn squash left. 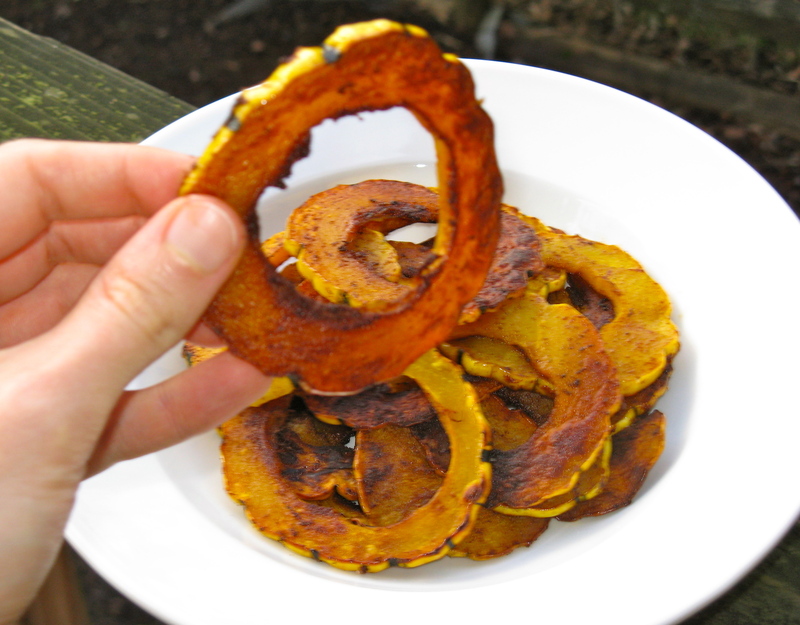 I LOVE delicata squash! I have never thought of cutting it into rings or putting cinnamon on it. I feel very lucky, there is a farm over here in Vancouver and he still has delicata. YUM! Going to make me some delicata right now for dinner. Thanks! Nice, take advantage of those while you can! Hope the squash turned out for you! I love that show! I don’t have TV, but when I do have access to one (usually when I travel), I always watch Chopped. In general, I really enjoy the Food Network, but especially that show. It can definitely be inspiring to get up and cook afterward. These look delicious! I’ve never had delicata squash, but I will have to keep an eye out for it!! 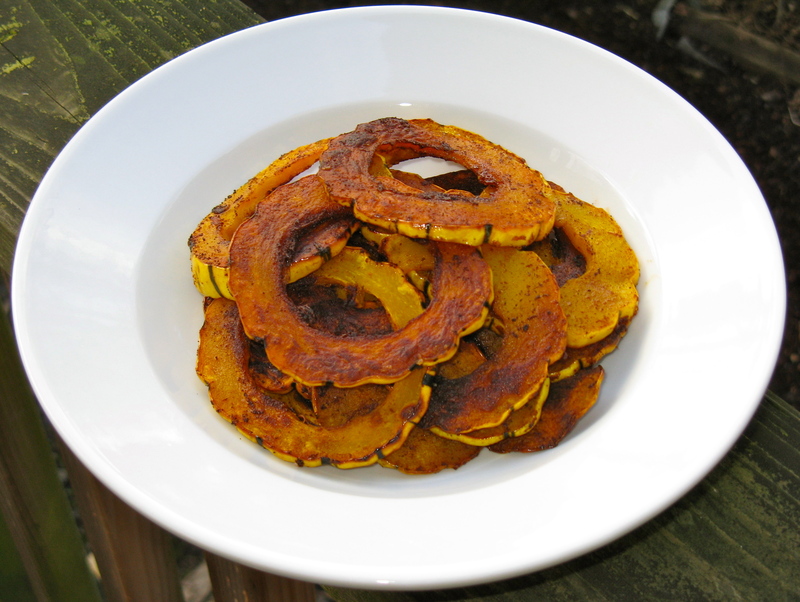 Delicata squash is one of my favorites! It’s becoming a lot more sparse in the stores though because it’s not really in season anymore. It’s most abundant during the fall.